The 27th of February 2016 was the first day of the landmark ceasefire agreement. Less than a day into a landmark ceasefire deal in parts of the country, residents say their usual routine has been thrown off without the usual sounds of artillery, rocket attacks, or helicopter-borne barrel bombs. Children play on a slide at a park in the city of Douma, on the eastern edges of the capital Damascus on February 27, 2016, on the first day of the landmark ceasefire agreement. A boy lies in a hospital bed after he was injured following airstrikes by the Syrian government forces on the city of Douma, east of the capital Damascus, on February 26, 2016. A boy reacts in a hospital bed after he was injured following airstrikes by Syrian government forces on the city of Douma, east of the capital Damascus, on February 26, 2016. Children play on a swing at a park in the city of Douma, on the eastern edges of the capital Damascus on February 27, 2016, on the first day of the landmark ceasefire agreement. A picture shows the body of a child wrapped in shrouds inside a morgue after he was killed in airstrikes by the Syrian government forces on the city of Douma, east of the capital Damascus, on February 26, 2016. A boy climbs a slide at a park in the city of Douma, on the eastern edges of the capital Damascus on February 27, 2016, on the first day of the landmark ceasefire agreement. Children walk past heavily damaged buildings in the city of Douma, on the eastern edges of the capital Damascus on February 27, 2016, on the first day of the landmark ceasefire agreement. A boy receives treatments at a hospital after he was injured in airstrikes by the Syrian government forces on the city of Douma, east of the capital Damascus, on February 26, 2016. 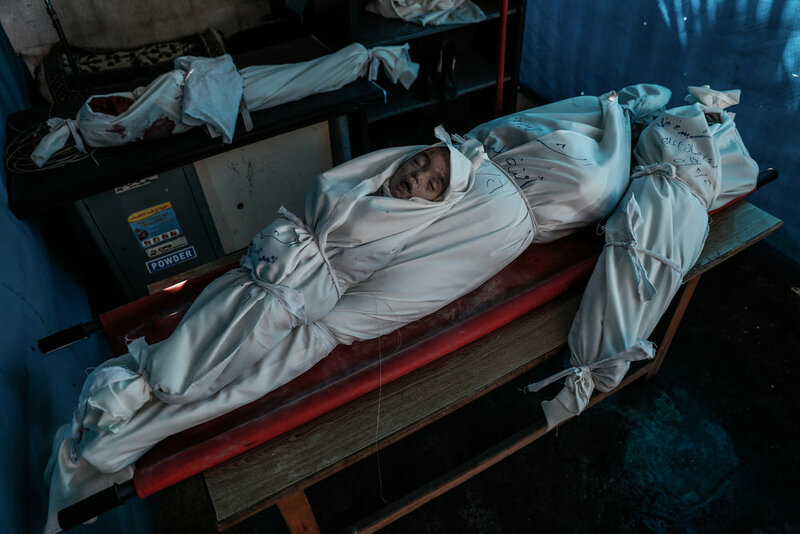 A picture shows the bodies of a woman and her children wrapped in shrouds inside a morgue after they were killed in airstrikes by the Syrian government forces on the city of Douma, on February 26, 2016.